The tallit, the traditional prayer shawl worn by devout members of the Jewish faith, has been a mark of reverence and piety for millennia. These beautiful prayer garments are worn on special occasions such as weddings, Bar and bat mitzvahs and Shabbat services. When not in use, these treasured tapestries are typically stored in bags that equal if not surpass the physical aesthetics of the tallit itself. This beautification of the faith is known as hiddur mitzvah, and it is the inspiring force behind the premium collection of tallit bags we at Zion Judaica are proud to offer our customers. 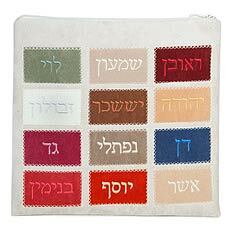 Zion Judaica is home to one of the Internet’s most extensive inventories of tallit bags. We have traditional tallit bags as well as contemporary tallit bags in a variety of styles and feminine tallit bags for women. Our needlepoint tallit bags come preassembled to allow you to customize your piece with your own needlepoint without the hassle of sewing and finishing. Along with our cloth tallit bags featuring materials such as velvet and raw silk, we carry tallit bags made of high-grade leather and natural suede. We also carry a selection of designer tallit bags by respected Israeli designer Yair Emanuel to suit more distinguishing tastes. We offer personalization services on many of our tallit bags in English or Hebrew to make the one you choose truly yours. At Zion Judaica, we search the globe to bring you the finest in distinctive tallit bags that make a unique statement of faith during your most sacred hours.